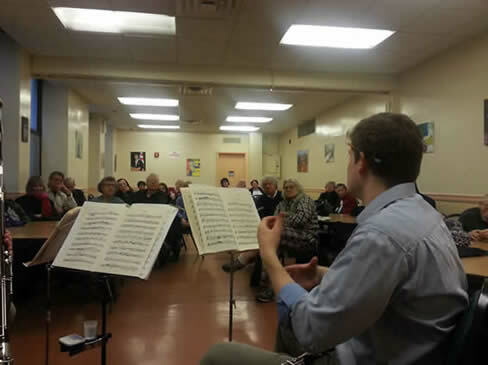 Ansonia Music Outreach has been bringing the gift of music to New York City audiences for 26 years, through our work with young people at public and private schools, our residencies designed to bring the musical arts to low-income and underserved populations, and our concerts for the elderly, the ill, and the physically disadvantaged. We provide quality cultural experiences that inspire and enlighten, making the arts more accessible to all people, where they live and work. Our mission is to help establish the musical arts as a more essential and valuable experience in the lives of the general public. Ansonia Music Outreach was founded in 1992 by graduates of The Juilliard School. After participating in the Juilliard Community Service Fellowship Program, they saw the great need to carry on this work as professional musicians. As the organization developed, the Phoenix Ensemble was formed, a chamber music group dedicated to the performance and recording of classical music, and to the mission and goals of Ansonia Music Outreach. Through concerts, recordings, and residencies in schools and communities, the Phoenix Ensemble has carried out the work of Ansonia Music Outreach, presenting hundreds of events designed to inspire a new and diverse audience for classical music. There is a large population of people who feel that the arts do not relate to them, that the arts are only meant for a small elitist or wealthy minority, or that the arts will simply never fit into the daily enjoyment of their lives. These beliefs are untrue, and the work and accomplishments of Ansonia Music Outreach demonstrate this. A continued decline in funding for arts education, a quickly changing generational perspective, and diminishing opportunities for the public to be introduced to and learn about the art form, has created an atmosphere where classical music is marginalized in this country. An effort must be made to rethink how classical music is presented, and to inspire a new and wider American audience, through a more innovative integration of the arts into the community. We are not only focused on reaching out to young audiences. Arts education and audience building efforts can be just as effective when directed towards adult and senior audiences. Since 1992, we have brought the gift of music to the underserved and to communities in need, for children, adults, and the elderly, enriching the lives of thousands, and inspiring many who previously were unaware of the positive influence the arts can make in their lives. Our Access to Music program offers events such as free concerts, music classes, and interactive workshops to disadvantaged and underserved audiences in New York City. Our Music for the Young program presents innovative concerts and events to young people designed to inspire interest in classical music and the arts, encourage creativity, and help make the arts an integral part of the school curriculum. Our Composer Workshop gives composers of merit the opportunity to create new works, to make accessible important music of our time, and to work on ways in which the particular musical style or message of new works can be communicated to a general audience, particularly young audiences. Mark Lieb is the Founder of Ansonia Music Outreach. 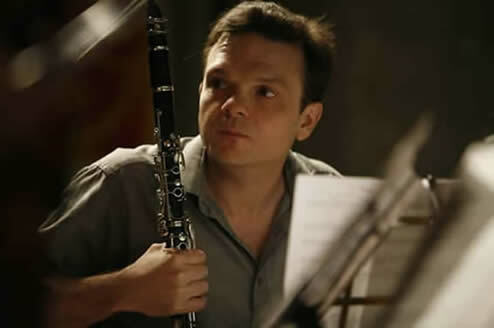 He is a graduate of Northwestern University and The Juilliard School, where he studied clarinet performance with Robert Marcellus, former Principal clarinet with the Cleveland Orchestra, and David Shifrin, former Artistic Director of the Chamber Music Society of Lincoln Center. He has been a professional freelance musician in New York City since 1991, and has performed and toured extensively throughout the United States, Europe, and Asia. He has recorded with New World Records, Mode Records, Furious Artisans, Newport Classics, Dorian, Innova Recordings, Albany Records, and BMG Classics labels. His arts education experience includes participating in the Juilliard Community Service Fellowship Program as a student at the school, and then after graduation, was the Manhattan and Brooklyn clarinet teacher for the New York Pops Salute to Music Program, worked for three years with Young Audiences of New Jersey, and one year with Midori and Friends. In addition to 26 years experience in nonprofit management with Ansonia Music Outreach, Mr. Lieb also has three years experience as Manager of Foundation Relations with the Big Apple Circus. Kenneth and Hazel Roe Foundation, Inc.
New Kalman Sunshine Fund, Inc.